If bad denotes “Low budget” I suggest FUBAR with Paul Spence and David Lawence. Yes Johnny, you should watch this movie. Well, I have seen it, but but it is a great suggestion. Folks, and if you like metal and like laughing then watch FUBAR. Wow… Why had I not watched this movie earlier? I just finished watching this 1970 sci-fi film and am kind of blown away. This is a great film. The U.S. government unveils Colossus, a sophisticated computer system designed to take the element of Human error out of the defense system. 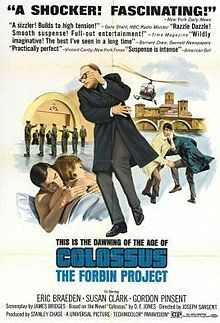 Colossus, designed by computer genius, Dr. Charles Forbin (is the most sophistcated computer ever created. Installed deep beneath a mountain, all of the United States defence systems are put under it’s control, to keep America safe from outside threats. Soon after activation, Colossus (which turns out to be even more intelligent and sophisticated than any one imagined), detects the presence of another, similar system in the USSR. Soon the two systems manage to communicate with each other, and merge as one, global computer system that controls the entire military might or the U.S.A. and the Soviet Union. Taking it’s initial program literaly, it decides that it must dominate mankind in order to eliminate the threat of war. Quickly demonstrating it’s seriousness by a number of missile launches and nuclear detonations, it is soon obvious that the world is at the mercy of this massively powerful system. Attempts to deactivate or destroy the system are countered quickly, and those Colossus deems guilty of the attempts are quickly killed. 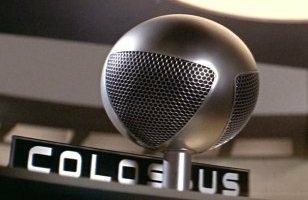 Based on the book, the Forbin Project, this is a piece of solid science fiction that seems to be fading from the global consciousness, which is a pity, because I believe that this is the germ of the idea that blossomed into the Terminator series – Colossus is a direct descendent of Skynet. Good acting and a tense plot makes this compelling watching. I also dig the 1970s look to high tech. If you get a chance and are a fan of science fiction then I say this is a must watch. That’s not too hard to do, as the whole movie is available freely on Youtube – that link to be found below the trailer. Well, this movie was a refreshing surprise: a foreign made Zombie film from Cuba that feels fresh. Fresh is hard to do with a genre like Zombie movies, but it was accomplished here. Filmed in Spanish with English subtitles, I had to stay alert, as Spanish is spoken faster than English and the subtitles didn’t stay on the screen long – luckily I have no issues with this, but I think a lazy reader might have issues – too bad: go back to school. Taking place in modern day Cuba, Juan, a local popular lothario and his buddy, the bumbling Lazaro, low level dissidents looking to make a profit in a society that eschews such things, finds money making opportunities when Cuban society is hit with a massive zombie outbreak. 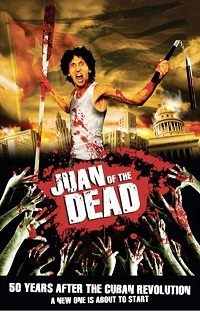 The film starts with Juan and Lazaro floating on a raft, fishing with little or no luck until he hooks what appears to be a corpse, but turn out to be a zombie. This sets the stage for the rest of the movie, and also introduces us to Lazaro’s bumbling response with any sort of a weapon. over the next few scenes we get to know Juan and Lazaro through their interactions with each other and those around them. This movie has a great look to it and seems unique – this probably has a lot to do with the fact that it comes from Cuba – I don’t think that I have ever seen a film from Cuba before, let alone a zombie movie from Cuba. Juan, seizing an opportunity when his city is over run with Zombies: he starts a business where he and Lazaro kills (re-kills, I guess), for a profit, family members that have become Zombies. A booming business. Eventually though, Juan and Lazaro’s friends and family start dwindling as more and more are either destroyed by Zombies or become Zombies themselves. This means Juan and Lazaro must make decisions as to how they want to proceed. I’m not going to say any more about the story, as it is a good one and I believe the only way I can do it justice is by telling you to see the movie. An original Zombie movie is rare. An original Zombie movie that is actually good is even rarer. Give this one a shot, as it really deserves it. 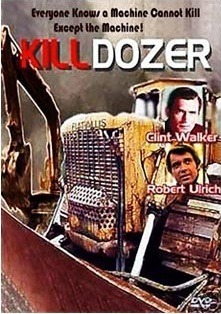 Killdozer was a 1984 ABC made for TV movie about an American construction crew working on a small island off the West coast of Africa building an airstrip that become victims to one of their heavy bulldozers that becomes possessed by an ancient force that fell from space a long time ago. The movies starts with a shot of a meteorite (meteor at that point, I think), plunging to Earth, coming to rest on the island. Next, we cut to modern (1974) day where the Mack, (played by a young Robert Urich), a member of the construction crew runs into trouble while trying to move a strange metallic rock. 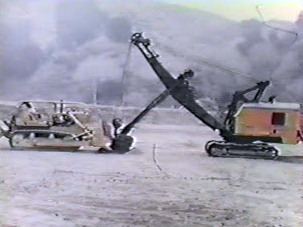 Unable to move it, his Foreman Kelly (Clint Walker) , tries, but when the blade of the bull dozer makes contack with the rock, a blue light emanates from the rock, jumping to the blade of the dozer, and throwing Mack in to convulsions, that later end with his death. Soon the remainig crew are picked off one by one by this possessed bull dozer. They try to survive, why looking for a way top stop the mechanical monster. I know the premise sounds stupid (no, is stupid), but I watched this originally as a kid and it really stuck in my mind – especially the epic battle between an excavator and the bull dozer – fun stuff. This isn’t an amazing piece of film history, but I thoroughly enjoyed it. The acting, while not stellar, is acceptable – and at just under an hour and 10 minutes, it won’t take much time from your life. I’ve just discovered that the whole film is available on Youtube, and have included a link to that below. I haven’t seen this movie since it was in the theatre. I forgot how funny it is. So stupidly funny that I am really surprised that I hadn’t re-watched it since. Actually, I’m surprised that it doesn’t get mentioned more often when people speak of funny movies. Starring a very young Michael Keaton as Johnny Kelly (a.k.a. 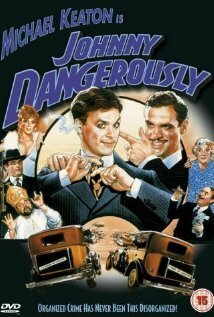 Johnny Dangerously), a good kid that turns to crime in order to pay for him mother’s operations for various outlandish ailments. The movie starts with Johnny working in a pet store where a boy tries to steal a puppy and is quckly aprehended by Johnny. Johnny then procedes to tell the boy how crime doesn’t pay, and through a flasback, we are presented with the guts of the movie. Johnny joins Jocko Dundee’s (played by Peter Boyle) gang and quickly rises to the top by proving himself in the constant battles between Jocko’s gang and their rival, the hilarious butcher of the English language Roman Moronie. Eventually Johnny takes over the gang when Jocko (played by the late Peter Boyle) retires after a silly assassination attempt. Johnny’s little brother Tommy (played by Griffin Dunne), in the meantime has grown up and become the assistant district attorney, Hell bent on fighting crime. When the crooked D.A. (District Attorney), played by the always funny Danny Devito, fails to corrupt Tommy, he tries but fails, to kill him by tampering with his car. When the D.A. dies in a silly manner a short while later, Tommy assumes the role of D.A. and cranks up his war on crime, eventually defeating Moronie and having him deported to Sweden… With Moronie gone, Tommy turns his focus on Johnny Dangerously’s gang. 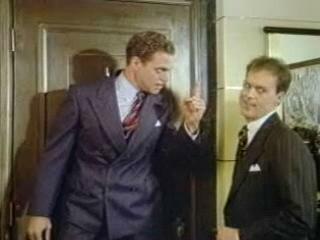 See, Tommy has no idea that his brother Johnny is actually the crime boss known as Johnny Dangerously. When he finds out, Tommy confronts his brother. Things work out between the two, and Johnny decides to disband the gang and go legit.When he breaks the news to the gang, things don’t go so well, when gang member an general douche bag Danny Vermin (played by rarely funny man Joe Piscopo) refuses to go quietly. Framing Johnny for the murder of the Governor and getting him sent to the big house, Vermin finds himself in charge of the gang, while Johnny looks to get out with the help of his girlfriend (played by Marilu Henner). If you haven’t seen this movie and enjoy quirky comedy and stupid puns then watch this. In fact, if you have a sense of humour at all watch this. Johnny Dangerously is a cute, silly comedy that deserves a lot more credit than it gets. It has a solid cast and respectable writing making it a good movie (I know: then what the hell is it doing on this site? Shut up…). 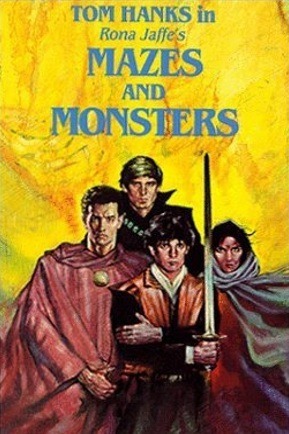 Way back in the early 1980s there was a gaming craze that was gathering popularity – Roll Playing games, and the number one game of that genre was (and still is) called Dungeons and Dragons. Like any craze that involves youths using there imagination to envision something fantastic, there were people with too much time on their hands that had to put their nose in others business and tell them that fantasy roll playing games were dangerous. Hell, they would lead to youths descending into a fantasy world in their mind and never come back. Mazes and Monsters is a movie that attempts to warn one of these evils – like the anti-drug movies of the 1950s and 1960s. Starring one time famous Canadian actor, Chris Makepeace (of Meatballs fame) and then star of the popular sitcom Bosom Buddies, Tom Hanks – yes, that Tom Hanks. This isn’t Tom Hanks first movie, as that dubious distinction goes to the movie, He Knows You’re Alone. Still, I doubt he talks about this film much. 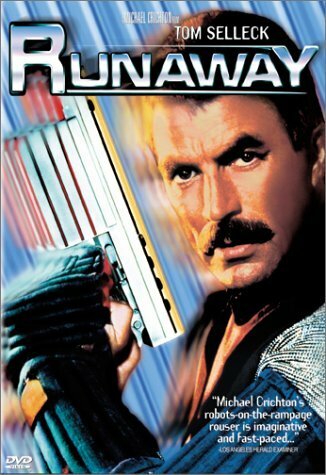 So, what can I say about this amazing piece of Canadian made movie obscurity? Aside from it’s terrible? Not very much, I guess. So, his friends have to find and save him, which of course ends in a nail biting race against time. This movie is very silly, and has definitely not aged well. That being said, it is interesting to see Tom Hanks so early in his career – he has come a long way since then. At lease it’s easy to find the movie: it’s available in full on Youtube. Check it out if you can stomach it.